Shortly after Kate and her family settle in, she and Dexter become friends with an attractive, mysterious couple named Julia and Bill. Kate's CIA background makes her realizes that Julia and Bill aren't who they claim to be, and starts finding ways to protect her family from these potential enemies who may be investigating her. As her experience in Luxembourg grows stranger with each passing day, Kate also suspects that perhaps her husband isn't who he claims to be, either. Just when you think you've nailed the mystery, Pavone throws another corkscrew into the mix to keep you guessing. The Expats flows very nicely from start to finish. Pavone's style is fun and direct, very "ha-ha" funny. I tend to enjoy novels with relatively short chapters, and this book is broken down exquisitely. The novel is told from Kate's point of view, so we get to enjoy her thought processes as she tries to figure out whether Bill, Julia, Dexter, or all of the above are deceiving her. Since I'm a huge fan of The Americans on FX, I got a huge kick out of reading about how Kate would go into actress mode when feigning ignorance about certain topics she knew everything about, being in the CIA and all. Loved it. I did feel that the novel may have been about 30 pages too long. I appreciated all the red herrings and twists, but I grew a tad weary of it all toward the end. Nevertheless, this novel is highly enjoyable, and I loved every minute of my time with it. According to Chris Pavone's website, he has recently released another novel called The Accident. I'll definitely have to add this one to my wish list, and stay on the lookout for a copy. 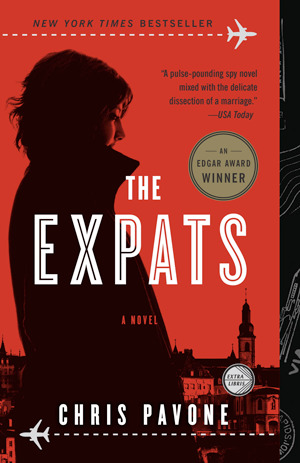 Have you read The Expats? If so, what did you think? Share your comments below.